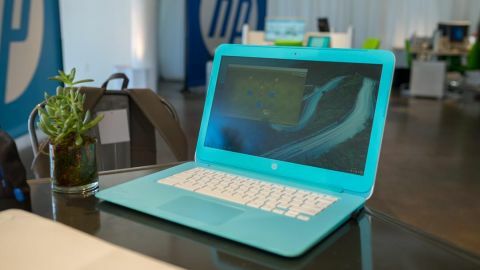 The HP Chromebook 14 is no performance powerhouse, but Chrome OS' speediness combined with a funky blue case makes this one fun notebook to use. We used to be bonafide Chromebook skeptics. Yeah, Chrome OS is neat enough, we thought – a straightforward operating system focused on getting you online as quickly and easily as possible – but it wasn’t our cup of tea. Why live your digital life entirely in a browser, relying solely on web apps to get stuff done? It almost seems like the digital equivalent of living out of a suitcase. Sure, you do it when you need to, but it’s not perfect for prolonged usage. If you think in the same way, the HP Chromebook 14, at $199 (about £230, AU$500) might not be for you – even if Black Friday and Cyber Monday laptop deals will make it extremely affordable. But, if you’re just looking for a device to check email and surf the web, it’s speedy enough. Its 14-inch display is bright and crisp and its trackpad and keyboard are great. The HP Chromebook 14 isn’t perfect, but it’s a solid all-around machine that may make you forget you’re leaving something behind. HP's Chromebook isn't exactly a high-end PC, but it's a slick, streamlined piece of kit nonetheless. The tapered enclosure measures 0.7 inches (about 18mm) thick at its thickest point. At 3.74 pounds (1.7kg), it's also reasonably light, though not as much as the 13.3-inch, 2.97-pound Toshiba Chromebook 2. That extra weight gives you a slightly larger screen, though, and the Chromebook 14 doesn't feel at all heavy in hand. The case itself is entirely plastic, and it does flex and creak some as you adjust the screen or pick it up one-handed. On the bright side, the case doesn't have any exposed screws, so you don't need to worry about a loose screen dropping out randomly. Oh. And it's blue. Very blue. Like, swimming-pool blue. The shade of blue, which HP calls Sky Blue, looks cool, but it isn't for everyone. A white keyboard and lid offsets all the vibrant blue, though it makes our Chromebook 14 review unit the PC equivalent of a Smurf. (Whether that's a good or bad thing depends on your taste in 1980s cartoons). You'll find no shortage of inputs on the Chromebook 14. The left edge features an HDMI-out port, a security lock slot, a USB 3.0 port, a headphone jack, and a MicroSD card slot. Along the right, you'll find the power connector and two USB 2.0 ports. Ideally, I would have loved if all three USB ports supported USB 3.0, but there's plenty of connectivity for most users. As a writer, I'm picky when it comes to keyboards, and I was pleasantly surprised by the typing experience on the Chromebook 14. The keyboard feels responsive with clicky keys and plenty of key travel. The keyboard flexes ever so slightly when I pound heavily on it, but under normal use, it isn't mushy at all. My gripe is there's no dedicated Caps Lock key; a Search key takes its place and must be triggered while holding the alt key. It isn't a big deal, but it makes it more difficult to impulsively tweet in all caps. The trackpad is equally excellent. It's big and spacious, with plenty of room to mouse around. The whole trackpad is a button, so you don't have to fiddle around to find the left- and right-click buttons. The button itself depresses with a satisfying click, but it's much stiffer the closer to the keyboard you go. If you're accustomed to the trackpad on, say, a MacBook Air, you'll feel right at home on the Chromebook 14.